Our Wild Tots Winter Term starts WC 19th November with sessions running each week on Tuesdays, Wednesdays and Thursdays. Suitable for 0-5s, your child can play, explore and get muddy as we take part in exciting woodland themed adventures, have fun and get closer to nature. There will be a different Forest School activity each week as well as a variety of activities such as den building, campfire cooking, minibeast safaris, storytelling, woodland games and much more! Back for our fourth year of celebrating a magical Christmas event! 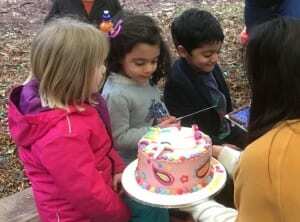 Join us in Grammarcombe Woods for a festive celebration at our woodland camp. We’ll start with some games followed by a Christmas craft activity, making a Christmas gift to take home and keep! The event will feature a surprise visit from Santa, who will join us from within the woodland with his elf helper and a special gift for every child! Tickets £9.50 child over 18 months, £6.50 adult. Price includes a Christmas gift for the children and refreshments (hot chocolate/ hot drinks) for all. Children under 18 months can attend free of charge with an older sibling; however if your child is under 18 months but would like food and a gift, or if they are not with an older sibling, then you must book a ticket for them too. Book now! 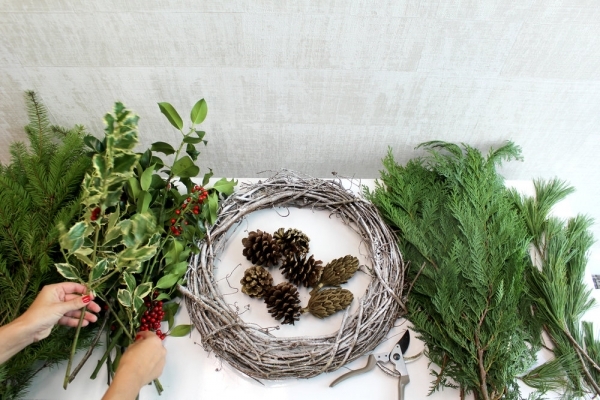 Join us in camp on the first day of advent, to learn how to make a beautiful Christmas wreath with camp leader Beccy Spiers, using a mix of seasonal foliage and natural materials gathered from the surrounding woodland. Mulled apple and mince pies included, as well as your handmade wreath to take home for your front door! Tickets £18, adults only. Price includes refreshments for all. Book now! Winter birthday parties are filling up fast! Our woodland Birthday Parties take place in a secret location deep in the woodland at Grammarcombe Woods, Ashcombe Estate, Near Exeter. We’ll make our way to our camp with our Forest School Leader and Assistant, following a blindfold trail to find the secret location. Starting with a game or two to burn off some excited energy, we’ll then gather around the campfire to learn about lighting campfires without matches safely. There will be plenty of opportunity for the children to try out their den building skills and enjoy our new woodland playground and mud kitchen followed by a camouflage hiding game and marshmallow toasting over the campfire. There’s time for delicious campfire sizzling sausages in a roll (if booked), before the party ends with a Happy Birthday song for the Birthday Boy or Girl. Got an older child or have a specific idea for the party? No problem – just let us know. We run events for all ages – children, teens and adults and will adapt our party activities according to the needs and ages of the group. Make their party a really wild one!